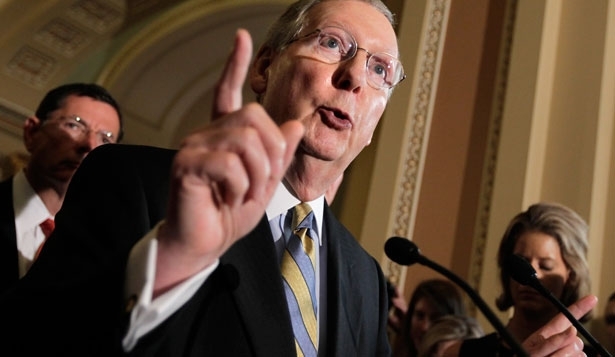 The Senate minority leader also didn’t rule out trying privatization again in the future. The Bush plan, unveiled in his 2005 State of the Union speech, would have allowed workers under 55 to divert half of their payroll taxes away from Social Security and into a private retirement account. This would have created an even larger shortfall in the Social Security Trust Fund and further hobbled the insurance program—something many people suspected was a feature, not a bug, for Bush and the conservative think tanks pushing his plan. There was immense backlash to Bush’s proposal, and Republicans never brought it up to a vote. It has since remained taboo even for many Republicans; Representative Paul Ryan dropped the idea from his budgets after the GOP took over the House. McConnell has been very quiet on the campaign trail about his role in the congressional debate, even though he was no doubt quite active as the majority whip at the time. This appears to be the first time he brought it up since the race began. It would not be surprising if video if McConnell’s remarks Thursday end up in another campaign ad very soon.